We offer dozens of prebuilt survey templates to make it quick and easy to start collecting data and customer information. 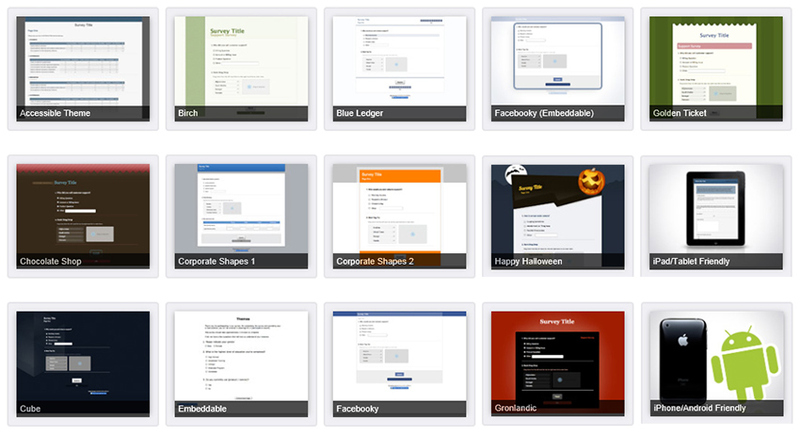 Our templates are fully customizable. Once you have customized your survey you can save it in the theme library for later use. Well-designed surveys are not only great for eye appeal; they also increase the likelihood of respondents completing your survey. Your surveys should be a reflection of your brand. It’s been proven that well-designed surveys with great eye appeal keep respondents more engaged and increase completion rate. Our theme library hosts 15 standard templates that you can use on your survey, and also acts as a library for custom themes you’ve created. You can add as many themes as you can create, and using the theme wizard, creating your own theme from scratch is extremely easy. You can also use our standard themes stored in the library as bases to start, and customize them as you see fit. Storing your custom themes in your library can keep you from having to remake a theme each time you need a new survey which saves you time and money. The library makes it easy for you to copy your template and make a few tweaks to make it fit your latest needs. The main point of our theme library is to allow you to really customize your survey. It’s for anyone who wants to customize their theme to better match their website and use it across multiple surveys. Instead of recreating the theme every time you create a survey, you can save a theme to the theme library and Compechek will always give you the option to use it. Another great time you may want to use a custom theme is with the change of the seasons. You may want to add just a tad more flair when it comes to your survey, and we have various themes in our theme library that help match up with some of the various seasons.